Painful feet? – It might be plantar fasciitis. The plantar fascia is a thick fibrous band of connective tissue originating on the bottom surface of the heel and along the sole of the foot. Plantar fasciitis is a term used to denote painful inflammation of this plantar fascia, usually from the repeated trauma that can result from unusual prolonged standing or exercise. Plantar fasciitis causes pain in the heal and sole of the foot, worse when you take your first steps after getting out of bed or sitting for a long time. Typically, the pain and stiffness will improve after you take a few steps, but it may come back after sitting, or after climbing stairs or standing for a long time. 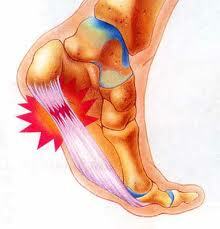 Being overweight, which increases the load on the plantar fascia and your foot as a whole. Unaccustomed or excessive physical activities, such as running, walking long distances, jumping, tennis, basketball, and aerobics. Having flat feet or high arches, which can pit additional stress on the plantar fascia. Standing or walking on hard floors for a long time. Flat shoes, that do not support your arch leave the plantar fascia unprotected. Many patients referred to my practice with painful feet and suspected neuropathy actually turn out to have plantar fasciitis. Rest your foot for 2 to 6 weeks. Stand, walk, or run less. While your foot is resting, try exercise that does not stretch your arch, like swimming or cycling. Pick shoes with good arch support to protect your plantar fascia and allow it to heal. Stretch your calf muscles and Achilles tendon. Wear splints to stretch the calf and foot at night. If the home treatment methods do not completely resolve your symptoms, you might want to see a podiatrist or orthopedist for a cortisone injection to reduce inflammation or a custom orthotic insert. Nonsurgical treatments are effective for most people. However, if your symptoms are severe and other treatments have not worked for at least 6 to 9 months, plantar fascia release surgery may be an option. Reblogged this on Pijnlijke voeten. Gamma knife tremor patient comes back to get the other side done! Alzheimer’s Tests on the Horizon? Helmets: do they work to prevent concussions? Bringing the ER to the stroke patient! Monmouth’s Facial Pain Center on CBS News!